Lot:50151 1901-24年海峡殖民地伍圆，样票。PCGS Very Fine 30. 1901-24年海峡殖民地伍圆，样票。PCGS Very Fine 30.STRAITS SETTLEMENTS. 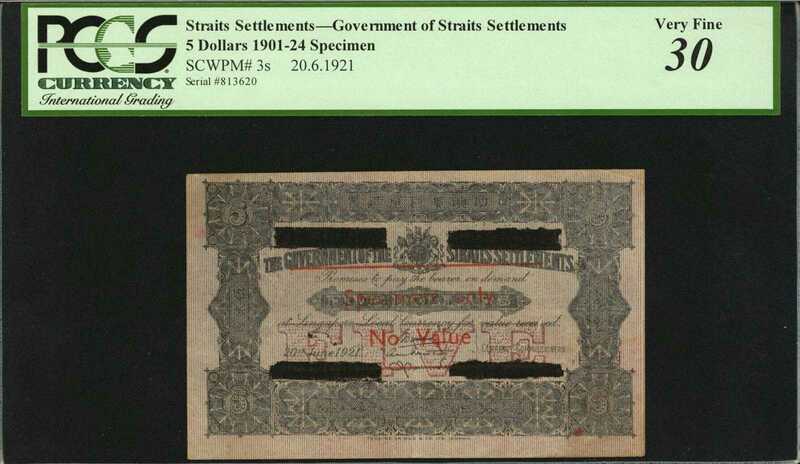 Government of the Straits Settlements. 5 Dollars, 1901-24. P-3s. Specimen. PCGS Very Fine 30.红色样票加盖"Specimen only, No Value"字样，序列号被遮盖。重要的版别，仅有均匀流通痕迹，少许红色墨渍。From the Yuri Solovey Collection.